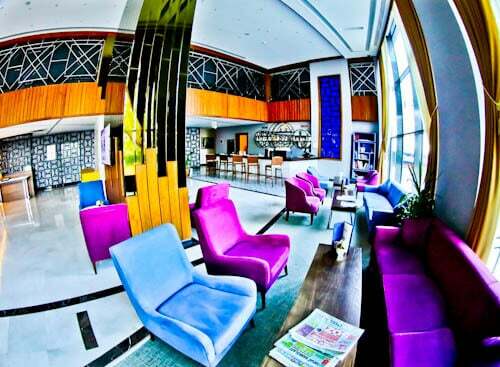 Visit the Radisson Blu Hotel Diyarbakir website for the best rates. 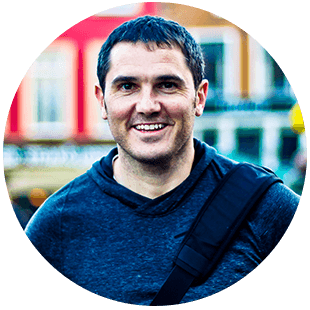 Additionally, there’s always more chance of a room upgrade when you book direct. 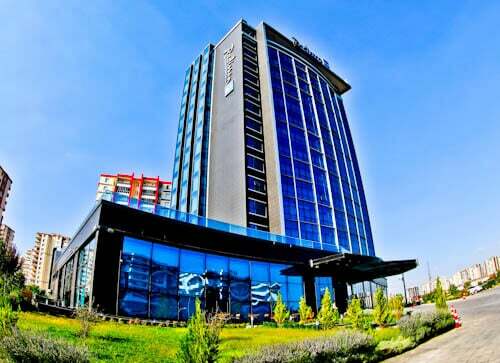 The Radisson Blu Diyarbakir hotel is located in the business district of the city. 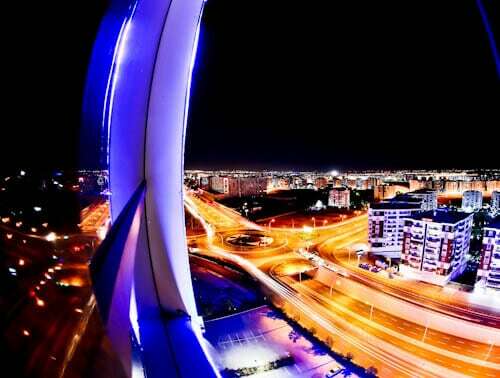 In fact, it’s one of the tallest buildings in the area therefore offers panoramic city views. Furthermore, there’s a bar and lounge on the top floor ensuring whichever room you choose, you can take the elevator to the top floor and enjoy these views. The reason I chose this location for my stay in Diyarbakir is because it’s very close to the long distance bus terminal (Otogar). 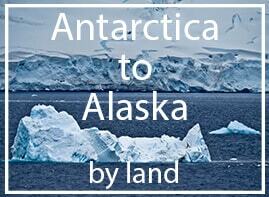 It’s also close to the train station and a 10 minute drive from the airport. From the hotel, a taxi to the historic center of the city costs from 20-30 lira and the taxis always use their meter. 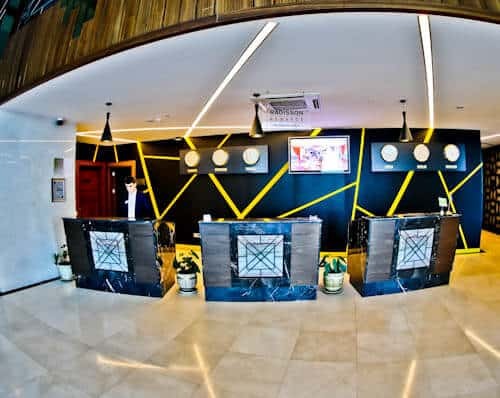 When you check in, you’ll receive a friendly welcome from the English speaking staff. Adjacent to the reception is a complimentary water station. A cold water and the cool air conditioning feels wonderful in this hot city! The staff can also call a taxi for you and give them directions to wherever you want to go in the city. They will also be happy to give you a city map and explain the points of interest. I was visiting Diyarbakir stadium and they were happy to call the taxi and give him directions. 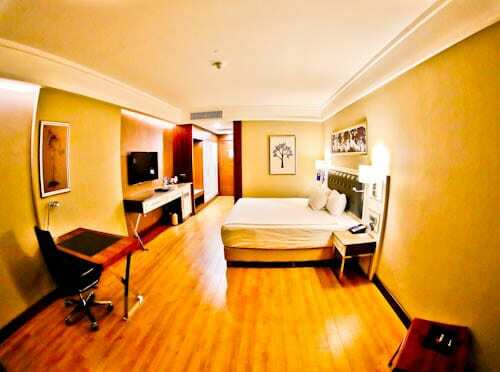 As you would expect from the Radisson Blu brand, the guest room is spacious as well as sparklingly clean. You have access to several cable channels in English. Importantly the fast, complimentary WiFi has a strong signal in the room. For business travelers to Diyarbakir, the desk area is particularly useful for working on your laptop. 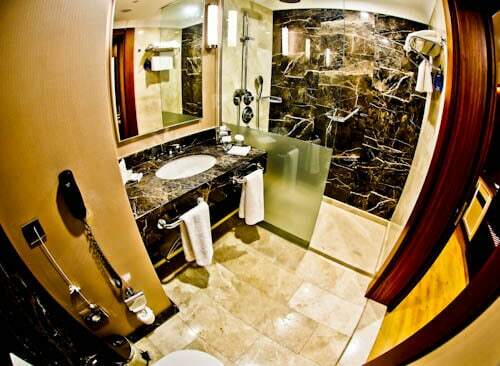 The en-suite bathroom, like the room is incredibly spacious. There is every bathroom amenity that you could possibly use. Additionally, there are large mirrors as well as the important hairdryer for the ladies (and men!). 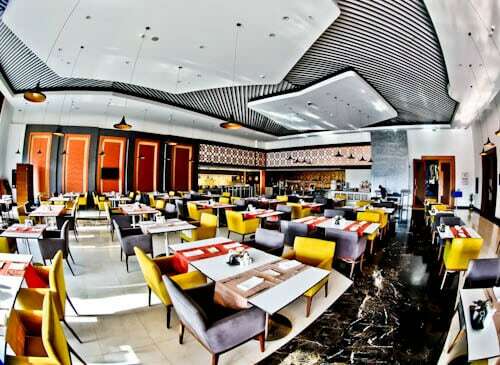 A buffet breakfast at Radisson Blu is always a feast and the Diyarbakir hotel doesn’t disappoint. There are fresh breads, sweet pastries, hot meats, cold meats, local delicacies, cereals, fresh fruits, yogurts and eggs. To drink there are juices, Turkish tea or Turkish coffee. It’s likely that the fresh breakfast buffet will fill you up until your evening meal. One of the top things to do in Turkey is take a Turkish bath, also known as a Hammam. 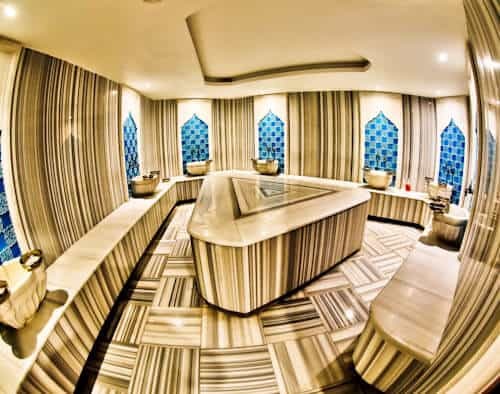 At the Radisson Blu, there is a hammam which guests have complimentary access to. In addition, the hammam was empty each time I visited, as a result it was like my own private hammam. During your stay at the Radisson Blu Diyarbakir hotel you receive complimentary access to a good sized sauna. Nextdoor to the sauna is quite a unique facility I’ve not seen in any other hotel, called the shock room. This room features a bucket of cold water above head height and a piece of rope you pull on. 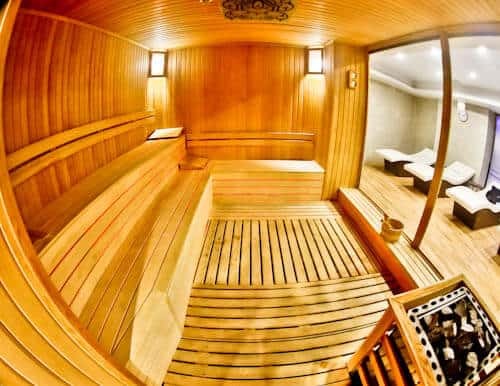 Essentially, you sit and have a bucket of cold water thrown over you, the perfect way to end your sauna experience! Additionally, there is a swimming pool area beside the sauna. As Turkey is a muslim country, women and men have separate areas. For this reason there are 2 of each facility, one side for men, the other for women. 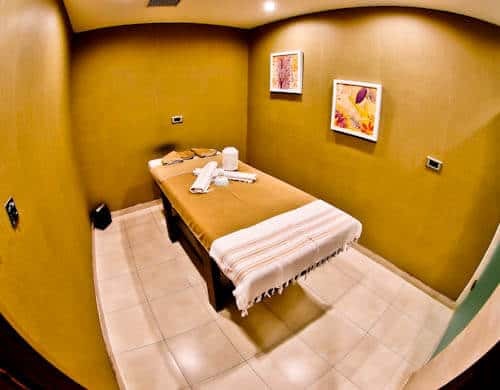 It’s possible to organise a private massage at the hotel. All amenities in the spa center are complimentary, however the massage comes at an extra cost. Private massages can be organised through the spa reception. The fitness center comes equipped with all the facilities required to perform your desired workout. If you like cardio, there are plenty of cardio machines. If you like to stretch and perform yoga, there are mats as well as Swiss balls. For those who like to lift weights, there are heavy free weights as well as machines. 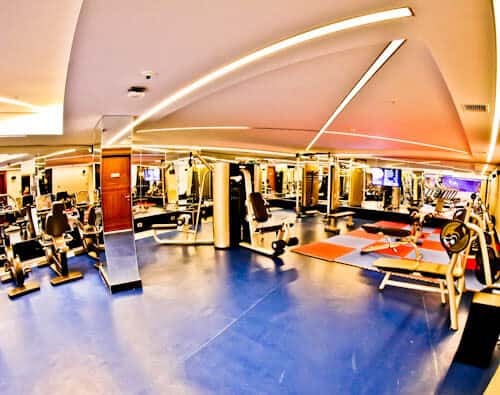 Most importantly, the fitness center is spacious therefore you have the required area to perform your desired routine. The lobby bar is a good place to chill out a little. I wasn’t leaving until early evening so enjoyed a couple of glasses of Turkish tea in the lobby area before heading to the long distance bus terminal. There is something special about sitting on the top floor of a tall building and admiring city views, even more so with a cool drink in hand. I would recommend visiting the top floor lounge and bar around sunset to enjoy the golden hour followed by the city lights illuminating. I booked my stay direct through the Radisson Blu Hotel Diyarbakir website and was lucky enough to receive a complimentary room upgrade. 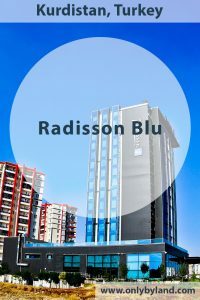 You must check out the prices, I believe this could be the best value Radisson Blu in the world! The use of the Instagram worthy hammam is a bonus!